Buyers | Desert Dream Realty Cave Creek | 480-252-8300 | Find Your Dream Home with Us! Welcome to the home buyers section. Here you will find information and tools about buying a home. Please select from one of the outstanding real estate home buying sections below. Need a little help with down payment or closing costs? One of these program might be the right fit for you. Some of them do not require you to be a first time home buyer. 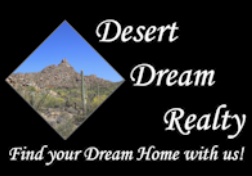 Search all Phoenix area listings, browse Desert Dream listings, and receive free property updates. Your First Step in Buying a Home- Find a Real Estate Agent, why you need a real estate agent and how to choose a REALTOR® for you. If you are a first time home buyer, this is where to start.